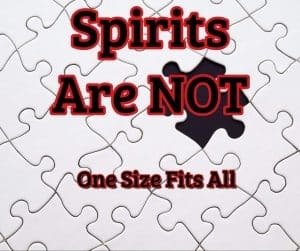 Spirits are not at all one size fits all category; they are the souls of those who lived on earth within an earthly host. Whoever admits to the existence of the soul that survives the passing, admits by this same that of the Spirits; To deny the Spirits would be to deny the soul. Generally, we have a very false idea of what spirits are; as some believe, vague and indefinite beings, that can be resurrected. Types of spirits or entities that can dwell within a person? Earthly are those who were trapped or have chosen to remain close to the physical dimension (earth). Some cases are due to traumatic experiences, that mentioned previously have not been able to acknowledge they have passed the physical dimension, others are malignant spirits who decided to stay on the earthly dwelling, causing fear, and terror among the living. They are NOT DEMONS, yet, they can become very dangerous and the invasion of one can cause damage, that is irreparable. Non-human entities are energies that have not come to incarnate in the physical realm. Some are harmless, others bizarre and unknown, not always negative. The most common forms or frequent names for this type of non-human entities are “shadows”, “dark angels” and “demons”. Elementals are spiritual beings that are commonly confused with other entities and have a great attraction to the fields of human energy. In their natural nature, elementals are not negative; however, if they are invoked in negative occult practices, they can shift their energy into negative form. Places where people have committed acts of extreme violence, elementals absorb these energies. Unfortunately, many elementals end up in the lower astral planes, take them algae in a fish tank, because they are corrupted by the most negative energy of the physical dimension, which is the greatest and most powerful energy being projected. Yes any positive ritual practice, prayer to free a host from an elemental, will in turn help cleanse the elemental. Signs of Harassment From a Spirit and How to Protect Oneself. There are several levels of spiritual terrorism, harassment, a possession that a person can experience. The main sign and factor, the simple presence of the spirit. Some people claimed to have the feeling of not being alone as if they were being followed and watched over by something that they can not figure out. This level can also produce paranormal phenomena such as strange knocks, mysterious voices, and other unexplained sounds. There are cases where people have reported seeing a threatening black mist or cloud near or above them, or from the corner of their eye. Taking it up a notch, the spirit begins to behave more intense. In these cases, people may experience irrational mood swings, depression, and feelings of anxiety, as mentioned before a severe change in the conduct. Finally, the “take-over”, causing frequent daymares/nightmares and unexplained pain joint pains. At this point, it is important to remember that before thinking that you have been a victim of spiritual attachment is necessary to rule out any medical problem. DO NOT self-medicate, diagnose or treat be it medical or spiritual. With medical problems being ruled out, the first thing to do to gain protection from this attack, starting in good health. Why? Well, a healthy body, clean and balanced mind are the solid bases of any defense against your soul being sucked, literally. The reason is that negative spirits have a low vibration rate, meaning that they feed of those who are down in the dumps, as that is their gateway to ecstasy to keep “living”, the positive and healthy energies vibrate and shine much stronger. Remember the shadows cannot exist in the light. It is very important to always remember that when a person is “taken” by a spirit, they are treated by someone qualified, as “playing” around can put this person’s life in danger. It is also important to remember that spiritual attachment has nothing to do with demonic possessions, as there no sort of exorcism being performed to break this connection. As we have discussed and talked about in many posts, with the gift of cross-dimensional channeling and the aid of Spirit, bringing you back to the light and the life you need is possible. DO NOT attempt at home on your own, any questions, need help feel free to call, write jenn@jennyssight.net or on facebook!